While Ash and Pete have weathered the storms of the past and neither man has lost sight of how much they love each other, with the beginning of ‘Circle’ there’s a distance between them that leaves both men feeling like it’s a distance that they’re not sure they can breach and it’s going to take the wisdom of some new friends and a trip away from home for Ash and Pete to find their way back home and to each other. “You carry mine as much as I carry yours. We’re wasting our time, otherwise." It’s going to take stepping outside of both their comfort zones for these men to find a way back to each other and recapture that magic that they share. Pete knows that there’s a wall between him and Ash. After all he’s the one who’s erected it but what he’s not prepared for is the fact that Ash is determined to fight for what they have and when push comes to shove Ash is not only willing to step outside of his comfort zone to set them both back on the same path but he’s going to take Pete right along with him. If I loved the first two books in this series I’m still looking for a word to explain how much I treasured this last step of their journey. 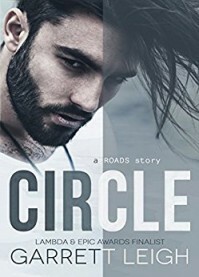 ‘Circle’ not only sees Pete and Ash working to find a way back to each other but to themselves as well…especially Pete. He’s been through so much and now it’s time for him to come to terms not just with what’s happened but with some of the things he’s done as a result and it’s time for him to trust that Ash is every bit as strong as Pete has claimed he believes him to be. While I’m not prepared to go into the details of things that have happened because I’d like to keep this a spoiler free review. I will say that after all that Ash and Pete have been through (and I’m going back to the very beginning of this series with this statement) ‘Circle’ is the ending that they both deserve and have both worked so hard for but it’s one that they’re also going to have to continue to work hard to get. Pete’s secrets were done and kept out of love for those who mattered in his life so truly I loved that Ash saw this just as Pete saw that Ash’s actions were about finding a way to bring them back together. I loved, loved, loved this series and being able to read it without any breaks in the stories was for me the best way to enjoy it and one that I recommend. Seeing the growth and change that each of these men went through was to say the least an emotional journey and seeing them get the happily ever after that they both needed and deserved was simply the icing on the cake. A copy of ‘Circle’ was graciously provided by ‘Signal Boost Promotions’ in exchange for an honest review.